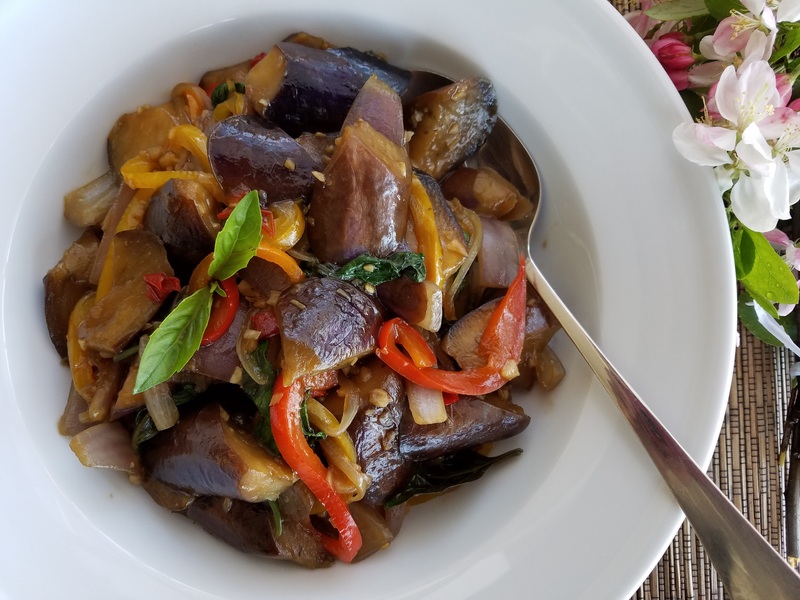 I never liked eggplants until I discovered this Basil Eggplant recipe. Basil adds so much flavor to dishes, it is my favorite herb in the kitchen. Use Chinese eggplants and do not peel the skin; the purple skin is the most nutritious part of eggplants. I added the colored bell peppers, and this turned out to be a very colorful and delightful dish. Prepare the sauce mixture and cornstarch thickening separarely. Set aside. Heat coconut oil in a large wok over medium high heat. Add half the minced garlic, purple onions and stir fry for a minute. 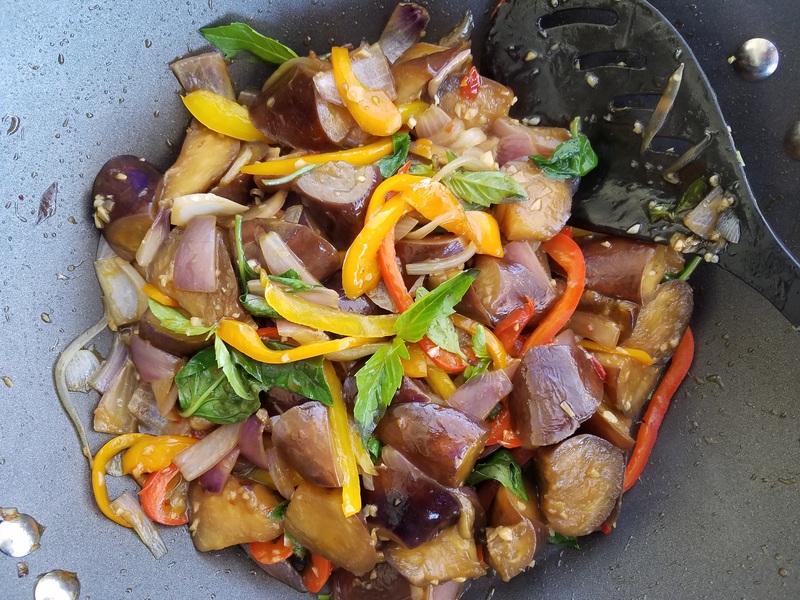 Add eggplants, chilli and stir fry for about 5 minutes. Sprinkle water over the eggplants in between to maintain a smooth stir. Add 2 Tbsp soy sauce, white onions, bell peppers, and continue to stir fry for another four minutes until the eggplants are softened. Add the remaining minced garlic and sauce mixture and stir fry for another minute. Add the thickening and stir. Add 3/4 of the fresh basil and stir until they are wilted. Turn off heat and transfer to a serving dish. Garnish with remaining fresh basil. Yum, sounds delicious! 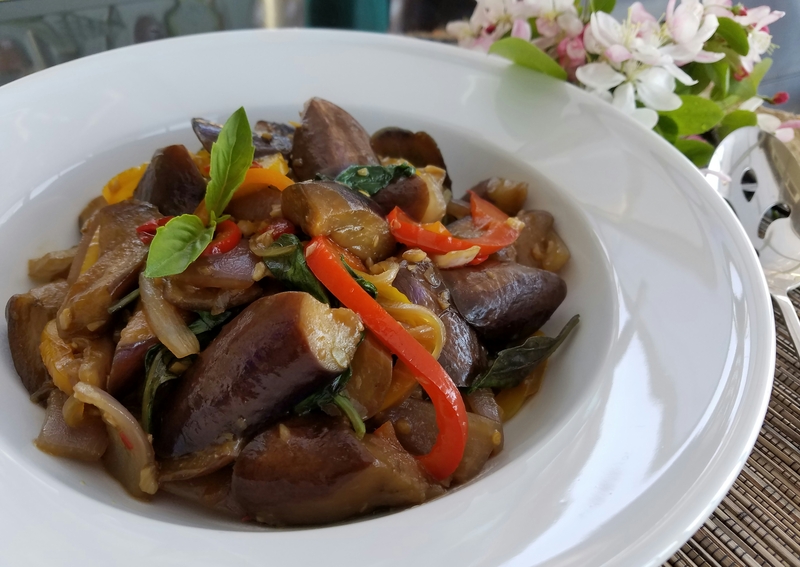 I love eggplant and basil.